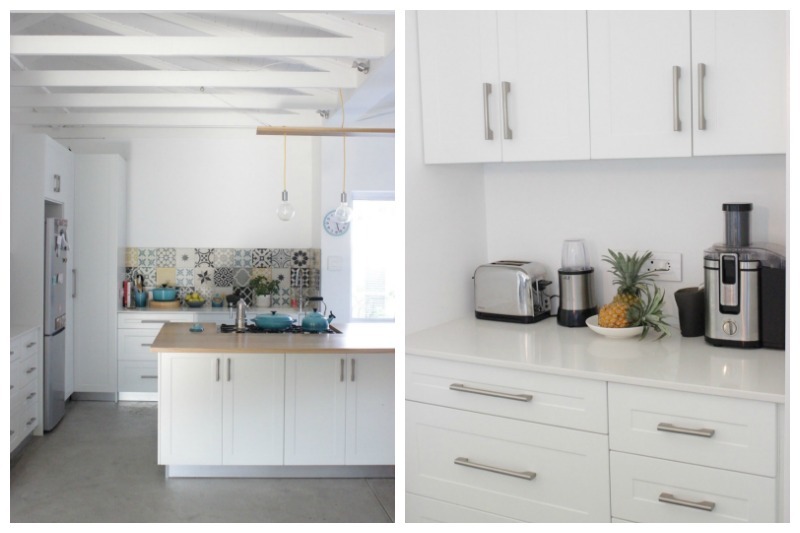 Today’s Room Reveal is a biggie… I’m finally revealing The Kitchen! For 15 years my kitchen was a small, cramped and rather dark. 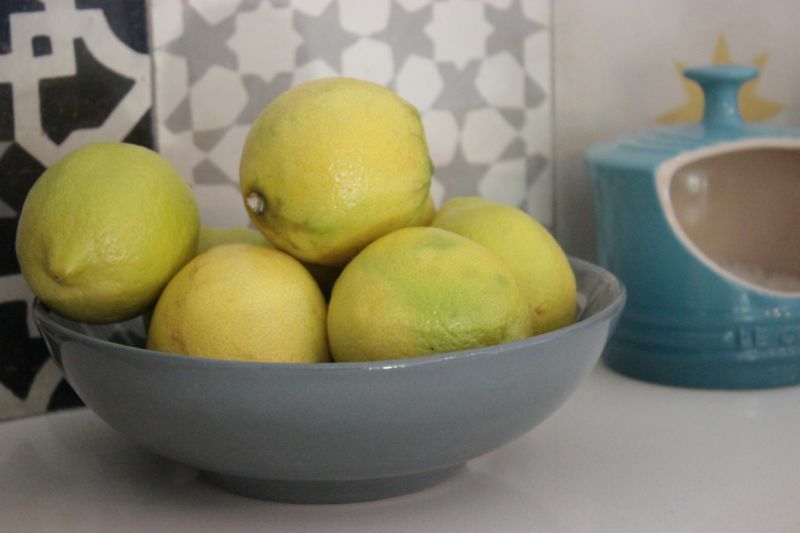 For years we lived with bottle green cupboards (many rotting), 1 small window that looked out onto an undercover back yard and we all crammed around the kitchen table to eat every night – literally able to reach all the counters from our chairs! It was what estate agents would call “cosy” aka tiny! After the bathroom this was my least favourite space in the house. I would avoid spending any time in here when at all possible. Eventually out of desperation we did paint the cupboards white but that only improved it marginally… It was in dire need of a complete overhaul. And that is exactly what has occurred. It literally looks NOTHING like it did before! We have completely opened up the space, breaking down the wall between what was the dining room and kitchen and then also extending the kitchen out into what was the back yard – a wasted space filled with dust and old toys! This has effectively doubled the size of our kitchen but it feels triple the size… the space is now HUGE. The flow is far more natural, there is plenty of light streaming in from the large glass windows and doors and the exposed trusses have opened up the ceiling and given the whole area an airy feel. 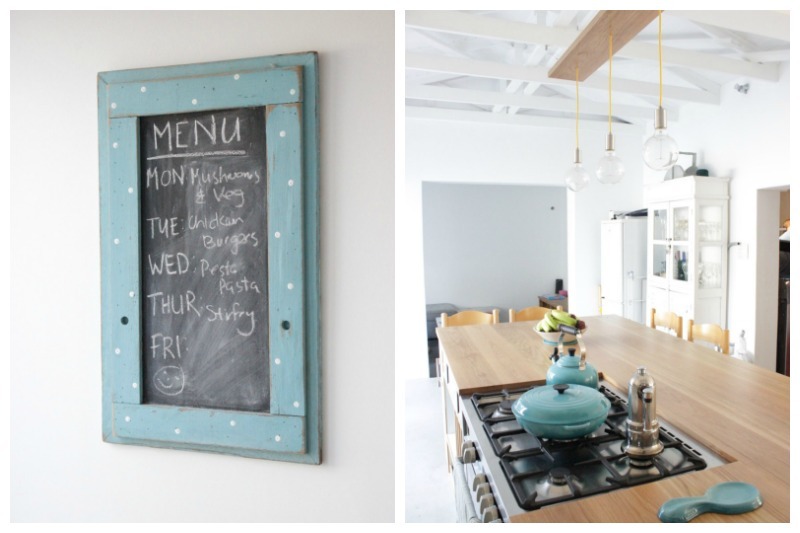 Our kitchen is now most definitely the heart of the home…. and I’ve actually been found to enjoy being it, even cooking every once in a while! Unheard of in the previous space. I think the biggest reason is that I love people. As an extrovert my idea of punishment is to shut me away in a room away from everyone else and that always seemed to be the case in our old kitchen. No one wanted to hang out in it. There was no room for them! Whenever we would have people round they would all sit outside near the braai and I’d be making the salads etc in shut away in the kitchen. Now when we have friends over they all come to hang out and chat with me over the kitchen island. It’s far more social and festive and pleasant for everyone! I LOVE it so much. If you can believe it, our kitchen was built single handedly by ONE woman. Yes just one, yes a woman! Fiona from The Wood Chef was incredible. Her workmanship was brilliant. She slowly and steadily created the space that I had dreamed of. Initially meeting with me to discuss my ideas, then working with me to plan how many draws and cupboards we would need to store all my kitchen paraphernalia, then chatting over their location, the style of the cupboards, the handles, everything. Kitchens are hard work. 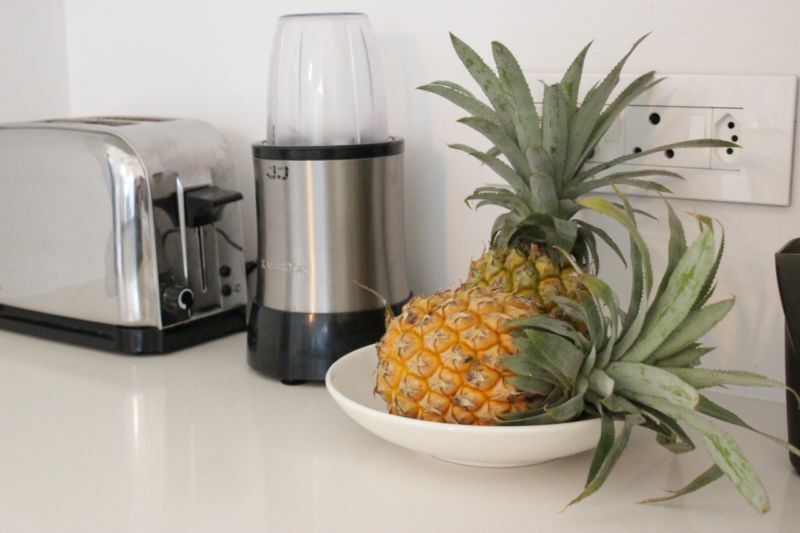 The amount of money you pour into them demands that you get them right… and I’d lived with a bad kitchen long enough to know that I needed to get this one right. And it needed to last for years. The cupboard inners are melamine while the doors are made from Supawood. I found the handles at Gelmar. The wooden counter is a Light Oak and my kitchen supplier ordered this for me. 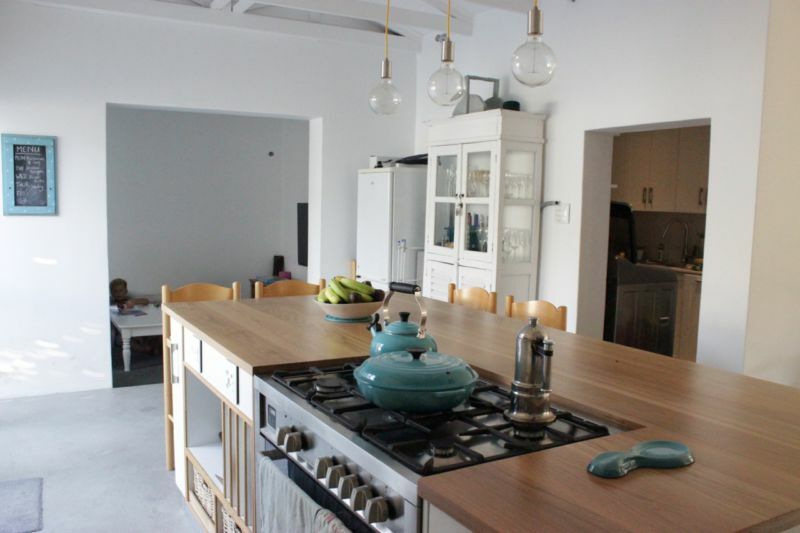 The other counter tops are white engineered stone (a cheaper version of Caesarstone!). 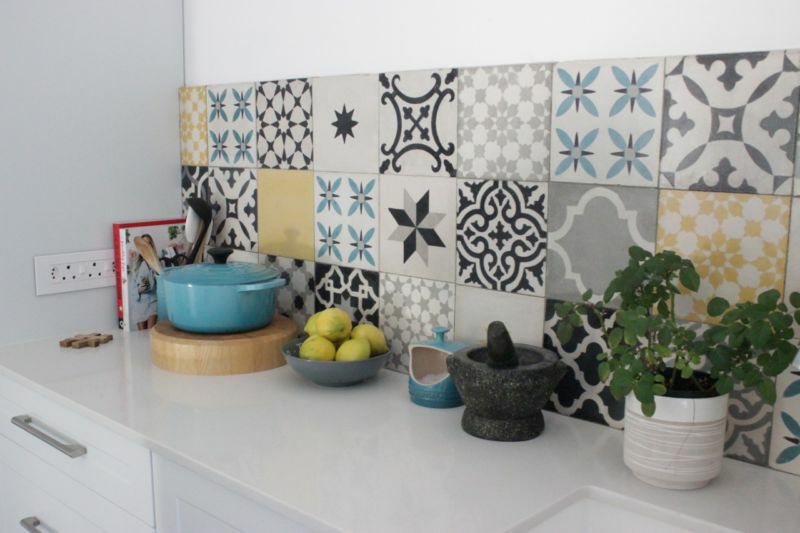 Moroccan tiles in various patterns and colours (turquoise, grey, black, white & yellow) from Moroccan Warehouse make up kitchen splash back and this is my favourite element of the kitchen. My whole colour scheme was generally quite white throughout the house and although beautifully simple I was a bit nervous that it might start to look very boring and pedestrian so I decided to add this fun element to inject a burst of personality to the space. It’s the first thing every visitor comments on when arriving in our home! 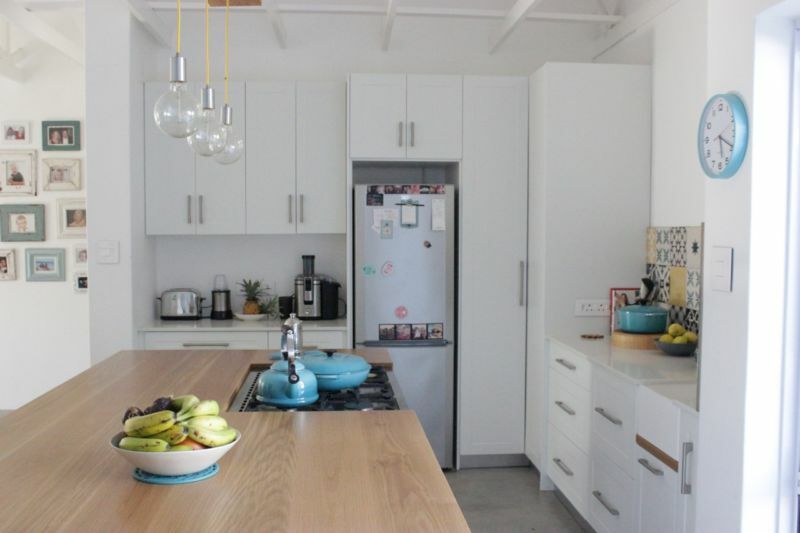 The plan was to have two long wooden shelves in the same wood as the island counter running across the wall above the splashback but after having the tiles go up we realised that two long solid shelves would mean that the impact of the splash back would be lost…. 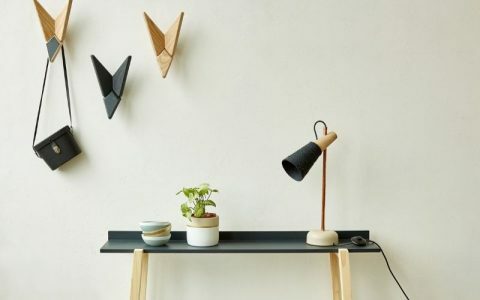 With renovating you need to be flexible as sometimes these sorts of things do happen so we decided to scrap that idea and put the shelves up in my study…. We are still aiming to put up a smaller floating shelf in this open area which will be used to display a few of the Le Creuset posts and some recipe books, maybe a trailing plant but for now our budget constraints mean that this will have to wait. What else can I tell you about in the kitchen? 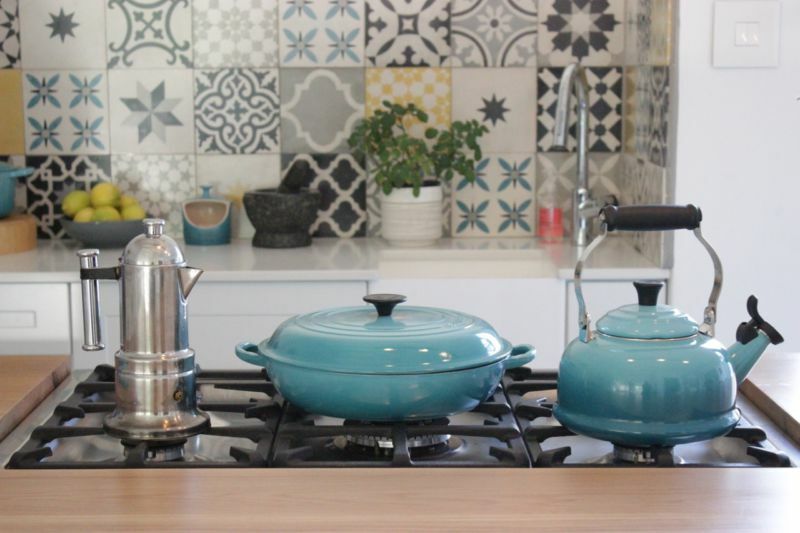 Over the years I’ve collected my Le Creuset pots always in the Caribbean Blue colour and this was one of the catalysts for the Moroccan tile colour palette. 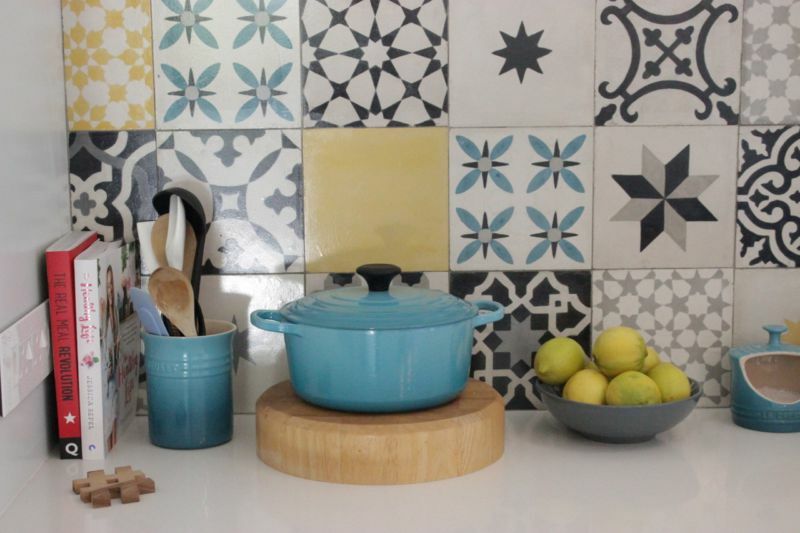 I wanted to pick up the blue in the tiles. The wall clock is from Home etc and the Menu black board in the exact same shade at Dassiesfontein farm stall on the N2 while on a camping trip in the area! My handy husband made the light fitting of which I am VERY proud. It was all his idea. 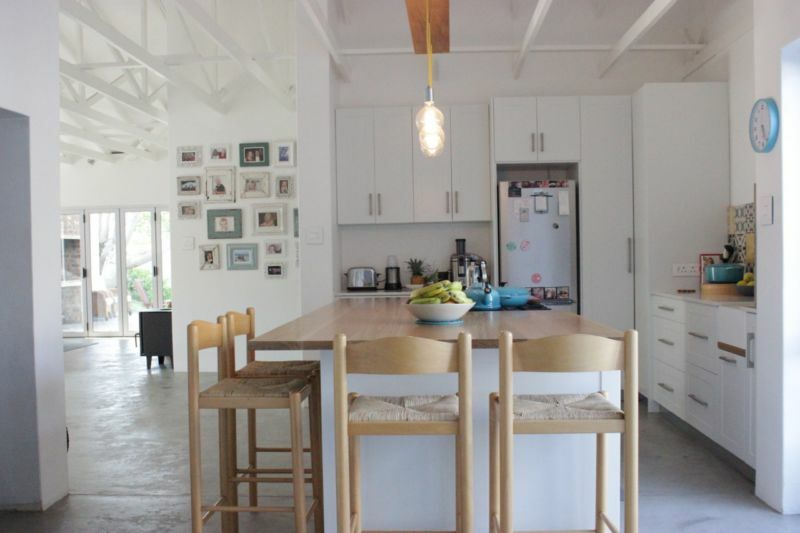 The “floating” wooden piece matches the kitchen counter and came from Fiona while the yellow cord is from Hoi P’loy and the exposed “Edison” light bulbs are from Mr Price Home. I was planning to have really trendy bar stools in either metal or natural wood. My plan was to have them in yellow too BUT budget has to be taken in to account sometimes (boo) and so after a few months of no where to sit I spotted these 4 for sale on my local suburbs Facebook group and R1000 for 4 bar stools was too good an opportunity to miss. 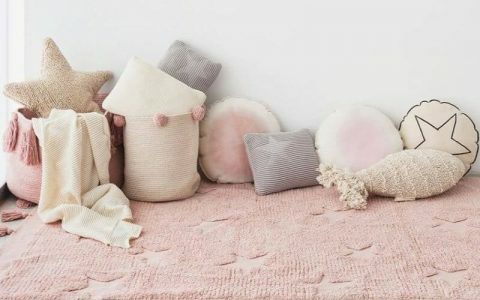 Although these aren’t entirely my style I do love a good bargain so I’m happy to have them for the mean time until we find some spare cash to invest in some more stylish stools! 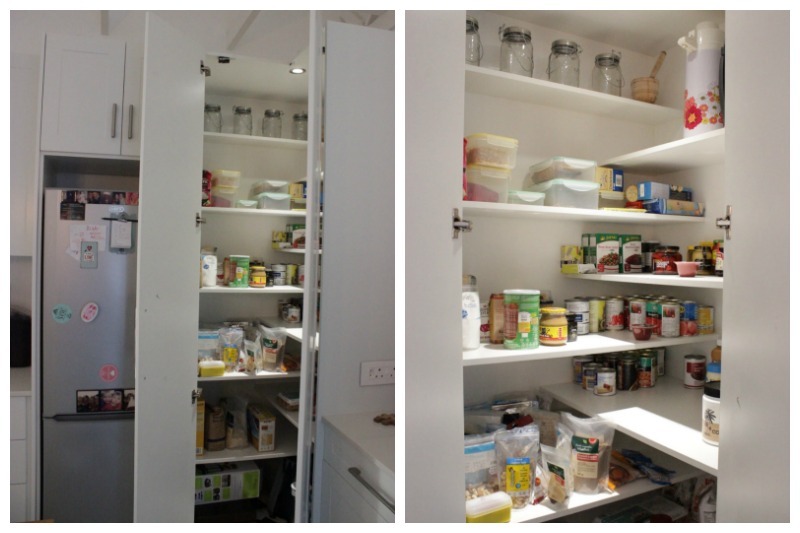 Probably the best practical feature of my new kitchen space is my pantry…. Oh dear that makes me sound like a real housewife right?! But seriously… how beautiful is it to have a space where you can open the doors and see everything at a glance. LOVE. My previous “pantry” cupboard was so low down and dark and dingy, you basically had to lie on your stomach on the floor to see what was in there. To be honest my husband threw out food from 2005 when we moved out. Oops! 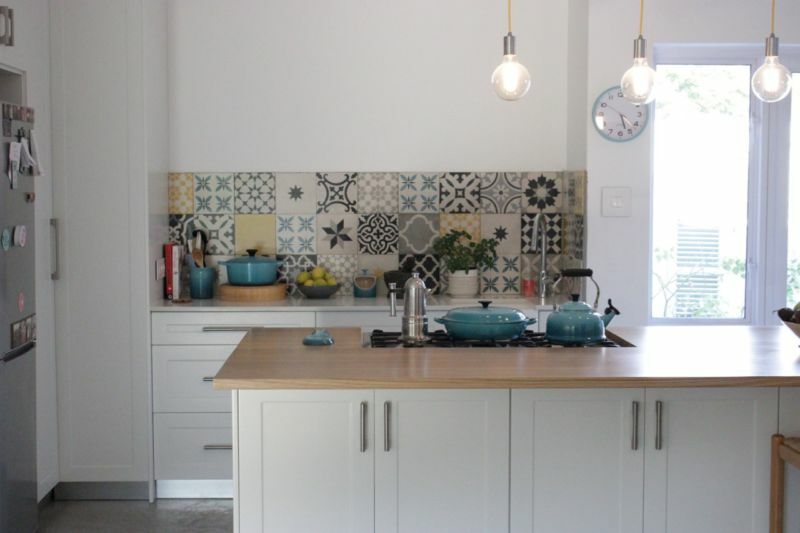 Our home style (if there is such a thing) was initially quite French in flavour, but over time my husband’s more Scandinavian aesthetic started to win me over… ultimately we’ve ended up with a style that might be referred to as Scandi Beach House with a touch of Morocco. There’s not much French to be found anymore! 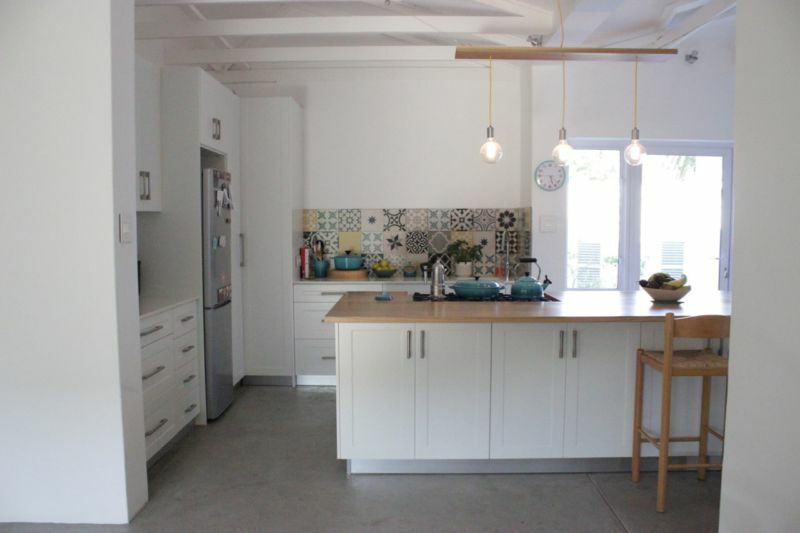 I think the evolution of the style was determined by the fact that I wanted this renovated space to last for at least 20 years, and that meant choosing the more modern fittings and fixtures that still fitted with my style. 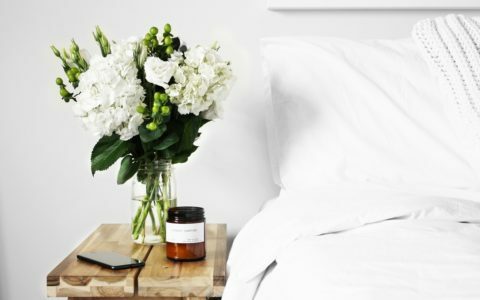 One of my most stylish friends wisely said to me while I was planning my renovations that my style is everything that I love and that if I love it then it will all work together. So I went with that and I think it really works! What do you think??? Kath, this is totally amazing!!! Wow wow wow! Love it! Beautiful space, well done! Love it. Aaaaah thanks so much Yolandi. I fell in love with those tiles and just had to add them in somehow and I really feel like they are working in the space. So happy with the final result! Stunning! 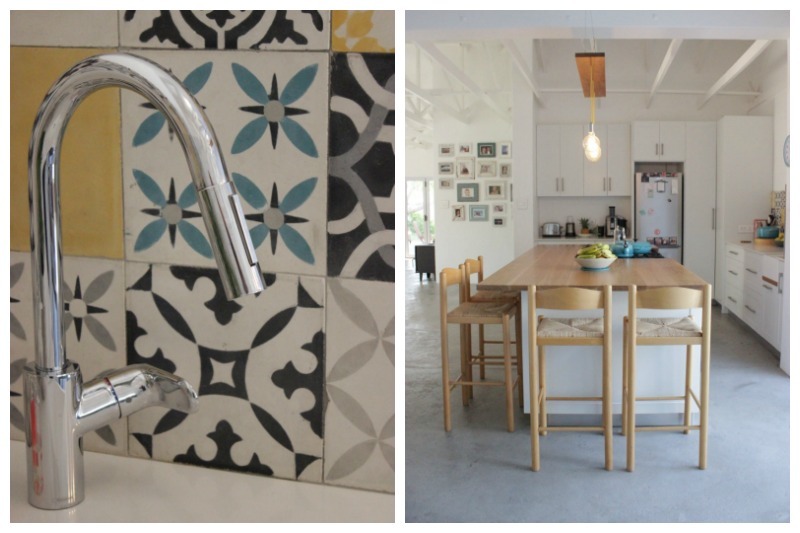 LOVE the tiled splash back. Thanks so much! It was more “out-there” than my usual simple style but I must admit that I think it made all the difference! That pantry & splash back and check the lights! !